This year marks our 20th anniversary, and there’s a number of ways we’re going to celebrate this milestone. One I’m particularly excited about is our tour to Cologne at the end of the month. 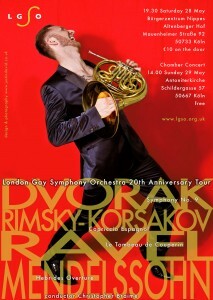 The last time the orchestra played outside of the UK was our December 2008 concert in Paris, where we did a joint tour with the Rainbow orchestra. They came to London one weekend, and we followed them back to Paris the weekend after. This year we’re off to Cologne, and although we’re not playing a joint concert with our friends in the Rainbow Symphony Cologne, we will be playing some of our favourite repertoire from the past year. Of course the logistics could prove to be quiet a headache. Getting 70 players and their instruments on the same train, sorting the venues, and making sure we have everything we need, would be challenging enough, but on top of all that, German isn’t my forte! We’ve also got to do a lot of promotion out in Cologne. Our usual concerts are heavily supported by a loyal base of friends and family, most of whom won’t be coming out to Cologne with us. We’re using the tour to try out a new concert format too. The day after our main concert, we’ll be putting on a chamber concert, giving our members the opportunity to showcase their talents in more ways than as part of the full orchestra. We’re still pulling together who might play, but we know that many of our members regularly get together to play in small groups and develop their skills in that way. And for those who aren’t involved, assuming that they aren’t still suffering from the excesses of the night before, they’ll be there to support their fellow players. The tour is another opportunity for us to promote the social aspect of the orchestra which is really important. The LGSO has never been solely focused on getting together to create music – we’re also focused on building a community within our players, and this tour is one of those opportunities for everyone in the orchestra to get to know each other a bit better, particularly our newer players. So, whilst its going to be a lot of work in the run up, its all going to pay off and we’ll have a great event. Keep an eye out on our Twitter and Facebook feeds to see how we get on auf Deutschland, and we’ll of course be posting photos here.